Striking seducers. 30.000 varieties. All about varieties and cultivation of these plants. Also created in the Côte d’Azur. Iris, a nice name. It makes you think to the changeable colours of the eyes, to the rainbow, to the scarf of the Greek goddess, which was unrolling in the sky of the Olympus. A bridge towards the mankind, a spring message, but a feminine message: the flowers of women. Seduction, deceit, beauty, enchantment, illusion. 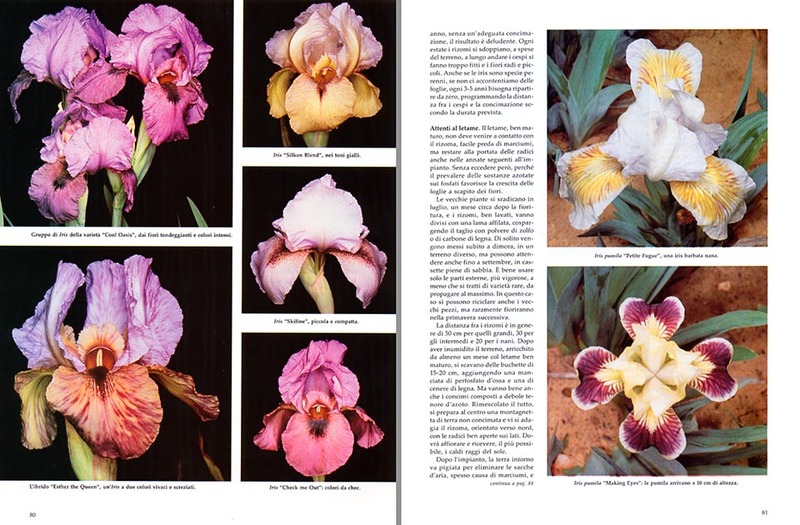 “The splendid colours of irises”, Pierre-Christian Anfosso, genial hybridizer of the Côte d’Azur, explains to me, “often do not exist, they are generated by an optical effect, by the light which decomposes in the crystalline structure of the corollas”. It’s like for the theatrical sceneries, the illusion of a big flower is trusted to few well ranged elements: three showy tongues towards the bottom, the “wings”, and three “flags”, which make it appear more important, taller, like the bishop’s mitre, or the hat of the famous cooks. 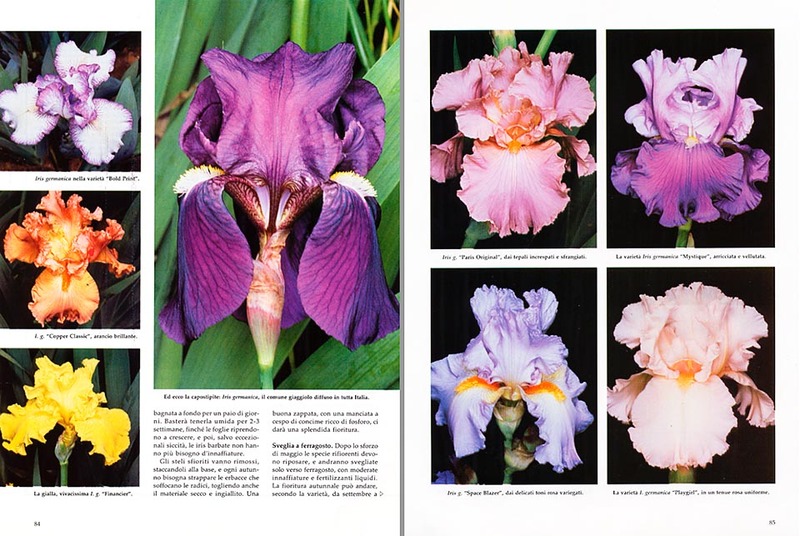 Petals and sepals for botanists, codified elements of appraisal for the judges of the competition, who, during the beauty contests, evaluate meticulously the shape, the inclination, and the colour, as it happens during the best dogs competitions. 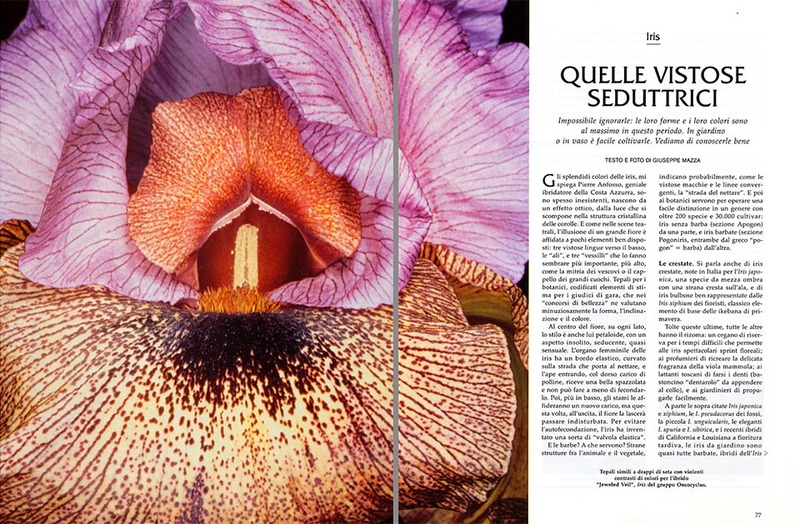 At the centre of the flower, on every side, also the style is petaloid, with an odd look, seductive, almost sensual. The feminine organ of the irises has an elastic border, bent on the direction which leads to the nectar, and the bee, when entering, with the back loaded of pollen, gets a nice brush and therefore cannot avoid to fecundate it. Then, down below, the stamens will entrust it a new load, but this time, at the exit, the flower will let it to get out undisturbed. In order to avoid the self-fecundation, the iris has invented, in its own personal way, before the man, a sort of “elastic valve”. And the beards? What’s their utility? Unusual structures, halfway between the animal and the vegetal, they probably indicate, like the showy dots and the converging lines, the “way to the nectar”. Furthermore, they are useful to the botanists for operating an easy distinction in a genus with more than 200 species, and 30.000 cultivars: Beardless Irises (section Apogon), on one side, and Bearded Irises (section Pogoniris, both from the Greek “Pogon = beard), on the other one. 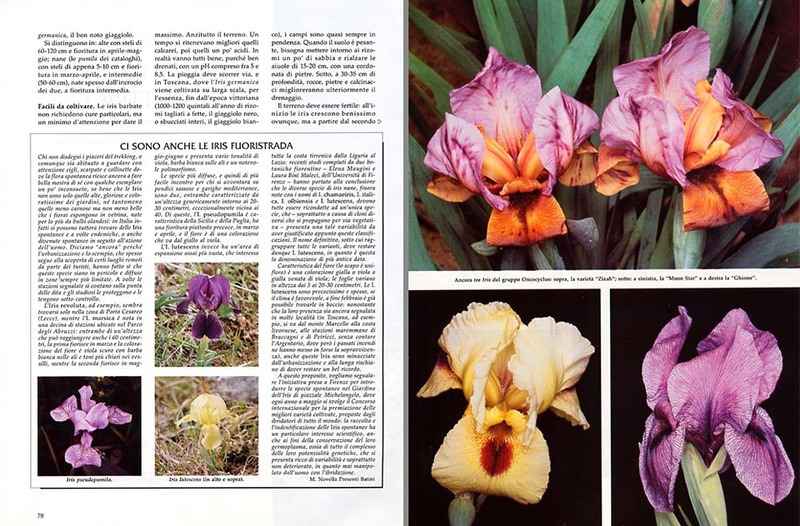 They talk also about Crested Irises, known in Italy due to the Iris japonica, a species for the mid-shade, with a strange crest on the wing, and of Bulbous Irises, well represented by the Iris xiphium of the florists, classical raw material for spring ikebanas. Excepting these last ones, all others hold a rhizome: a spare organ, for the hard times, which enables the irises to effect spectacular floral sprints, the perfumers to create anew the delicate fragrance of the violet, the Tuscan breast-fed babies to cut their teeth (“teething ring”, to wear round the neck), and the gardeners to propagate them easily. Apart the previously cited Iris japonica and I. xiphium, the wetlands Iris pseudacorus, the tiny Iris unguicularis, the elegant Iris spuria and I. sibirica, and the recent late flowering hybrids of California and Louisiana, the garden irises are almost all bearded, hybrids of the Iris germanica, the well known flower-de-luce. They distinguish in tall, with 60-120 cm stems, and flowering in April-May, dwarf (the “pumila” of the catalogues), with 5-6 cm only stems and flowering in March-April, and intermediate, often born from the cross breeding of the previous two, with intermediate flowering. Almost all the blossoming-again varieties, which sprout then anew in autumn, belong to the last group. 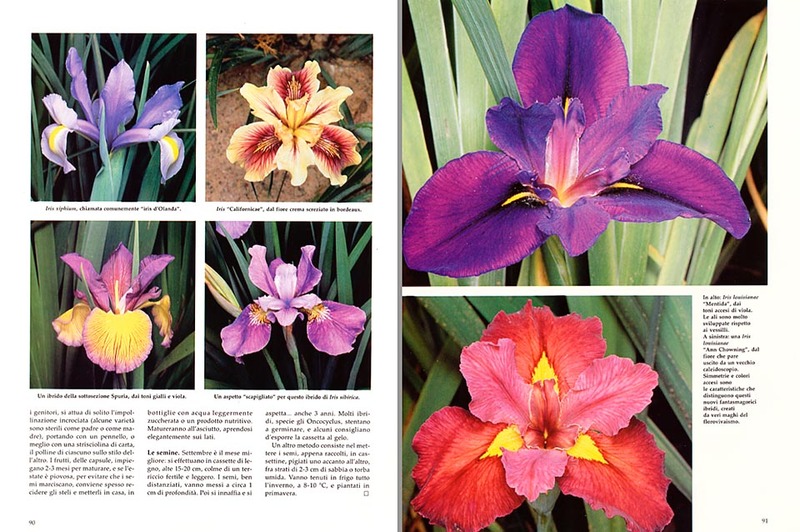 Easy to cultivate, the bearded irises, do not require particular cares, just some attention, for giving the maximum. First of all, the soil. Time ago, they thought that the calcareous ones were the best, later on, the rather acid ones. As a matter of fact, all are suitable, provided well drained, with a pH between 5 and 8.5. The rain must flow away, and in Tuscany, where the Iris germanica is grown to a vast extent, for the essence, since the Victorian era (1.000 – 1.200 quintals per year of sliced rhizomes, for the black iris, or peeled whole, as for the white iris), the fields are almost always sloping. When the soil is heavy, we have to put around the rhizomes, some sand mixed to loam of leaves, and raise higher the flower beds of 15-20 cm, with a stone ramp. Under them, at a depth of 30-65 cm, rocks, stones, and masonry debris will furthermore improve the drainage. Then, the soil must be fertile: at the beginning, the irises grow up very well everywhere, but, starting from the second year, the outcome becomes deceiving, without an adequate manuring. Each summer, the rhizomes split, at the soil expenses, on the long run, the tufts become too thick, and the flowers, thin and small. Even if the irises are perennial species, if we do not content ourselves of the leaves, every 3-5 years we have to start from zero, programming the distance between the tufts, and the manuring, depending on the expected duration. The dung, well ripe, must not get in touch with the rhizomes, easy prey of rottenness, but have to remain within reach of the roots, in the years following to the installation, when only intervention from above will be possible. And all this without any excess, as the prevalence of nitrogenous substances on the phosphates, encourages the growth of the leaves to the prejudice of the flowers. We can use also old compounds, obtained from the fermentation of the waste (weeds, dead leaves, foodstuff leftovers, dung), integrated with complete fertilizers, rich in phosphorus. The old plants are to be uprooted in July, roughly one month after blooming, and the rhizomes, well washed, must be divided with a sharp blade, strewing the incision with sulphur-powder, or with charcoal. As a rule, they are to be settled in place immediately, in a different soil, but they can wait, even until September, in small cases full of sand. It is better to use only the external parts, more vigorous, unless it’s matter of rare varieties, to be propagated at the most. In this case, also old pieces can be recycled, but they seldom will bloom the next spring. with ripe manure, two small 15-20 cm holes must be dug, adding, as our old people recommend, a handful of super phosphate of bones and one of ash of wood. But, also composed manures with a weak contents of nitrogen, are suitable. Once mixed up well the whole, we must prepare, in the centre, a small mass of new manured soil, and we lay down there the rhizome, orientated towards the North, with the roots well open on the sides. It will have to emerge and get, as much as possible, the warm rays of the sun. Like the nice-looking summer tourist girls, the irises like to tan for the whole day. After the installation, the earth around must be pressed, in order to eliminate possible air-pockets, often cause of rottenness, and thoroughly moistened for a couple of days. It will suffice to keep it humid for 2-3 weeks, till when the leaves start again to grow, and then, unless exceptional droughts happen, the bearded irises do not need any more watering. The faded stems must be taken off, detaching them at the base, and every autumn, we have to pull up the weeds which choke the roots, taking off also all dry and yellowed material. A good hoeing, with a handful on the tuft of manure rich in phosphorus, will give us a splendid spring flowering. After the May effort, the re-blooming species must rest, and will have to be waken up only around mid-August, with moderate watering and liquid fertilizers. Autumn flowering can last, depending on the varieties, from September to December, and if we wish it to be rich and abundant, it is then better to take off some stems in spring. The pompous hybrids of Oncocyclus and Regelia, with exotic corollas, full of spots and fascination, distinguish at once from the other bearded for the ball-shaped flower. They blossom early, in March-April, and then rest. They need a perfect drainage, and a long, dry, warm summer, like in Middle East, the country of their ancestors. In the locations where it rains, it is better to take off the rhizomes from the soil after the flowering, as soon as the leaves yellow, and keep them till September in dry sand. Otherwise, they can be cultivated in pot, sheltered by a balcony, or a roof. To hybridize irises is a hobby, is not difficult. Chosen the parents, we have to effect, usually, the crossed pollination (some varieties are barren, as father of mother), carrying with a brush, or better, with a small stripe of waste paper, the pollen of each one to the style of the other. The fruits, capsules, take 2-3 months to ripen, and if the summer is rainy, in order to avoid that the seeds decay, it is good practice, often, to cut the stems and place them at home, in bottles with slightly sweetened water on a nourishing produce. They will ripen in the dryness, opening smartly on the sides. September is the best month for the seeding. They must be effected in small wooden cases, 15-20 cm tall, full of a fertile and light mould. The seeds, well spaced, must be placed at about 1 cm of depth. Then, we have to water and wait… even 3 years. Many hybrids, especially the Oncocyclus, have difficulties in germinating, and somebody suggests to expose the case to the frost. Another method consists in placing the seeds, as soon as picked up, in small cases, packed one close to the other, like sardines, between layers of 2-3 cm of sand, or humid peat. They must be kept in fridge fro the whole winter, at 8-10 °C, and planted in spring. The chances of success, are, in this way, multiplied by four. 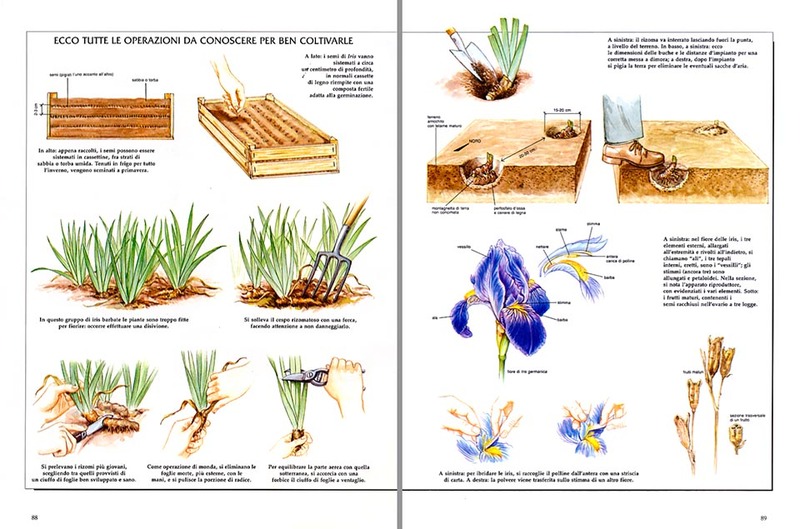 → To appreciate the biodiversity within the IRIDACEAE family please click here.